The ancient Kingdom of Axum, now a part of Ethiopia, was one of the first nations in the world to adopt Christianity. The religion took strong foothold in 330 AD when King Ezana the Great declared it the state religion and ordered the construction of the imposing basilica of St. Mary of Tsion. Legend has it, that it here that Menelik, son of King Solomon and the Queen of Sheba, brought the Ark of the Covenant containing the Ten Commandments. By the fifth century, nine saints from Syria, Constantinople and elsewhere had begun spreading the faith far beyond the caravan routes and deep into the mountainous countryside. These missionaries played a key role in the initial growth of Christianity in Ethiopia. The monks translated the Bible and other religious texts from Greek into Ethiopic allowing the locals who couldn’t read Greek to learn about Christianity. The religion’s mystical aspects found a curious draw among the young. As Christianity grew, a series of spectacular churches and monasteries were built high atop mountains or excavated out of solid rock, many of which are still in use today. These ancient churches were often built in the most impossible of places. A good example is the Abuna Yemata Guh in Tigray, in Northern Ethiopia. This 5th century church is perched 650 feet up in the sky, on the face of a vertical spire of rock. To reach it, one has to climb without any climbing ropes or harnesses, inching along narrow ledges and crossing a rickety makeshift bridge. The final leg of the journey involves scaling a sheer 19 feet-high wall of rock. 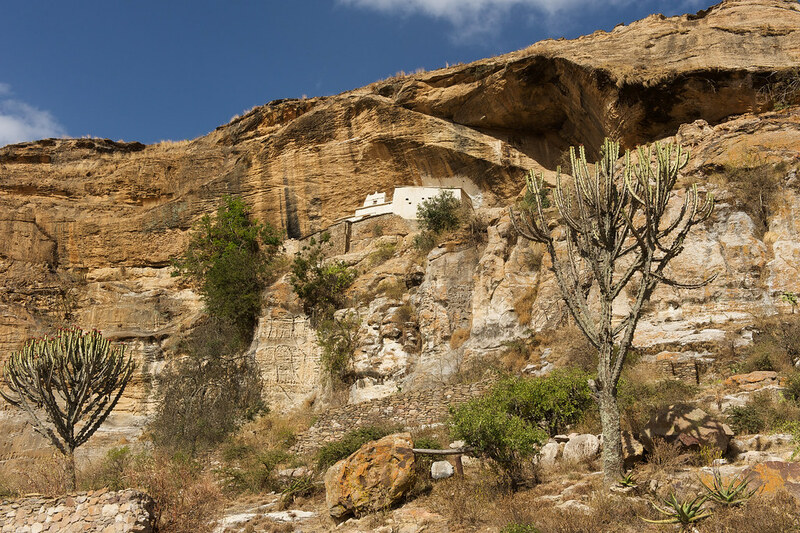 The church was founded by Abuna Yemata, one of the nine saints, who chose the secluded spot as his hermitage. Beautiful frescoes cover the inside of the Abuna Yemata church. A priest holds open an ancient goat skin Bible decorated with vivid hand-drawn illustrations and ornate calligraphy. A 200 metre high “bridge” made of logs on the way to Abuna Yemata Guh. The church bell for Abuna Yemata Guh is actually two stones hanging halfway up the cliff. This 6th century monastery is located on top of the flat-topped mountain called Debre Damo. The only way to the monastery is up a sheer cliff 50-feet high. The monastery was founded by Abba Aragawi, one of the 'Nine Saints', and is known for its collection of manuscripts and for having the earliest existing church building in Ethiopia. The Debre Damo monastery is accessible only by rope up a sheer cliff. The Petros and Paulos church is located, like many others, in the Gheralta range. The church isn’t truly rock-hewn because only the sanctuary is cut into the rock, the rest of the church is built out onto a ledge. Reaching the church originally involved climbing a steep cliff using only foot and handholds. Today, it is replaced by a rickety wooden ladder.